One of the Pay-per-views that you just feel that the WWE should drop in some respects because although the matches are extreme rules because of its PG rating the content isn’t all that extreme. It could be however the age difference between myself and the fact that I am not moving on to the new or younger generation of WWE fans this might be what they consider extreme rules but I myself remember the days that Cactus Jack and HHH went into a cell and both were busted ear to ear and although you still have those matches and we all know it’s not real per say it added authenticity to the programme. Although I had a good idea what was on the card for this pay per view I have to admit right now that it is the first one in about a year that I have not watch the previous RAW just to get the final cliffhangers in the saga, due to the fact that I have slowly been going off the WWE, I don’t think it’s because of the lack of talent on the roster but it’s just too predictable at the moment there isn’t really an element of surprise who’s going to go for who and who’s not. Now let’s get down to business the stand out matches for me was Dean Ambrose v Luke Harper, Big Show v Roman Reigns. These were the stand out matches because in my opinion they were really well done, you could feel the intensity of the Big Show and Roman and you could feel that the two guys really was out there to get the win. If I am honest it has been one of the better matches I have seen from the WWE in a long time and the ending was pretty fitting with the use of a table to hold down one of the competitors. Although not the first time someone has used items to hold down people when in a last stand match however this was new to use the announcer’s table to do it. 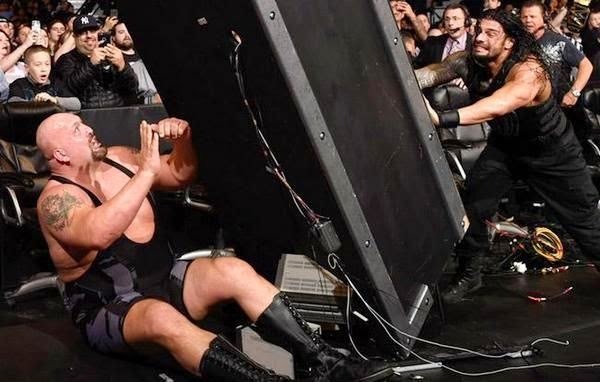 The reason that Dean Ambrose and Luke Harper really made it was the way in which the match was done it could have been one of the longest one on one matches that WWE has had because they left the arena for an hour and the cameras didn’t follow. Which kind of goes back to my earlier rant that when the street fights did break out into the street of yesteryear the cameras would follow although I did like the gimmick of Luke Harper driving off only for Dean Ambrose to drive back and continue the match an hour later. Each had done their homework on each other meaning that they reversed some of each other rules and I would say that it was one of the more aggressive and deranged matches on the card and one worth catching up with. Now to the main event if I am honest I like it, I wouldn’t say it was a standout match but it was put together and the whole thing with the internal problems that The Authority are having with Kane and Rollins did add the extra dimension to the match with him at ringside never quite sure which way he was really going to go, but in true Kane style he came into line but in his own way. It has left us with an interesting RAW next week for the fall out of Kane’s actions I think. Overall I would give this pay per view a 7/10 because it was ok but I have to admit although some good points I am losing interest in the WWE again.